This is a masterfully crafted Mens Romain Jerome Liberty DNA Automatic Black PVD Stainless Steel Watch. This dedicated tribute to the Statue of Liberty has infused with the DNA of the statue herself! This Limited Production timepiece of one of the United States of America’s greatest symbols is a must have collector’s item! This sells brand new for $14,900 plus tax today. 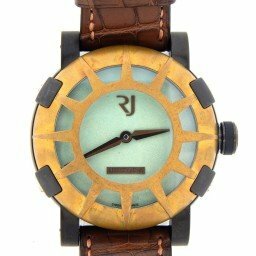 Dial Original Roman Jerome BLUE GREEN verdigris dial. This unique beauty was crafted with incorporated particles Lady Liberty herself, giving the dial the authentic coloring of oxidized copper. Bezel Original Romain Jerome BRONZE bezel. The bezel is adorned with 12 spike hour markers, evoking the aesthetic look of the Statue of Liberty’s crown. The bronze metal of the bezel will patina over time, adopting the same coloration of the famous statue. There is a tiny ding on 3 spike…it blends in with the natural look of the bronze. Case Original Romain Jerome black PVD stainless steel case. The case back has a detailed engraving of the Statue of Liberty’s torch emblazoned behind a black & white American flag with the individual number of this limited timepiece (055/125). There are a couple small dings on the lower left lug. Band Original Romain Jerome vintage style dark brown alligator strap with Romain Jerome signed clasp. This is a very thick and well made leather strap! The dark color of the leather compliments the watch perfectly.